The vSphere Pocketbook 2.0 Blog Edition has been released! I have also decided to post my contribution to the pocketbook here for all to read as well! Enjoy! As with most design decisions it becomes imperative that all steps are taken to prove out a design that meets and exceeds all expected goals. In the world of virtualization, the choices we make are the new foundations of the enterprise. This is why it’s more important to get the process right in making a good design decision. It’s much easier to correct the implementation than having to go back and start over with the entire process. It is with this mantra that I want to explore one idea on how to implement a Systems Thinking approach for good design decisions in virtualization. As technologists we thrive on new products and services that tickle our inner ego. This is where it becomes imperative to implement a process that incorporates all inputs that can help drive a successful design decision. The old military adage of “7 P’s” (Proper Planning and Preparation Prevents Piss Poor Performance) can even be relevant in a virtualization type of project design. This preparation and planning can be realized in the collection of inputs to a project design, where they can be broken down into smaller pieces for ample analysis. This is called the Feedback loop – a causal path that leads from the discovery of a design gap to the subsequent modifications of the design gap. It’s this reciprocal nature of Systems Thinking that provides a constant feedback loop to the design. The ultimate goal is a design that changes based on external parameters to meet a new set of goals or challenges. If you can get to a design like this, then you can become more agile and not have to implement patch solutions to accomplish a new forced or unforeseen change. To illustrate how such a process can impact design decisions, let’s first look at a common problem in many environments. Many organizations are growing their virtualization environment at a rapid pace therefore, there is a constant pressure to provide enough storage capacity/performance as the VMware environment constricts. As you can see this is a simple, yet applicable example of a feedback loop that can help you break apart the pieces of a design to come up with an effective solution. Let’s now go through the pieces to understand the relationships and the effect they can have on the design. As the “User Base” or as “Applications” are virtualized this puts added pressure to increase the number of ESXi hosts to support the compute requirements. 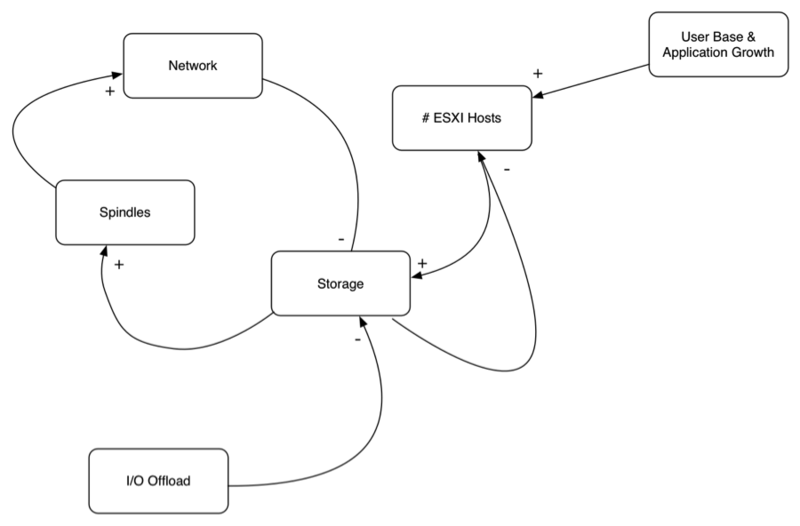 As in most environments the number of ESXi hosts increase; this will increase the demand and contention on the storage systems to keep up with the I/O load. In order to keep up the capacity growth demands and I/O performance load, this pushes the admin to add more spindles to the storage environment. More spindles allow for more I/O processing which as a result could increase the demand for a faster storage fabric. This loop finally decreases the demand on the storage system in a response to the growth, but as you can see it’s only temporary, since there is still added pressure from new user and virtualization growth. The only way to turn the tide on the storage pressure is to instrument a negative reinforcing loop. An “I/O Offload” solution can help by decreasing the demand on the storage system and thus provide better consolidation back onto the ESXi Hosts. There are already a few good posts on VMworld 2014 sessions to attend. Those that have the full conference pass or VMUG Advantage can always view the sessions at a later date, but I always like to attend a few live sessions for the interaction. This is my current list of must see VMworld 2014 sessions! Listen to Andy Daniel speak his wisdom on PernixData FVP! Come hear Michael and Harold reveal their secrets on building a world class design! An absolute must see session from two masters in their own right! I think this will be a good discussion on getting started with NSX from a design perspective. At VMworld 2013 in San Francisco, I recorded a session at the vBrownBag Tech Talks. There were some technical difficulties during the process and so I thought I would re-record the same talk so that it would be easier to hear and see the presentation. This presentation is intended to illustrate why the storage fabric can not be overlooked when designing for storage performance and why server-side flash with PernixData completely solves I/O bottlenecks within the virtualized datacenter. I welcome your questions or feedback. 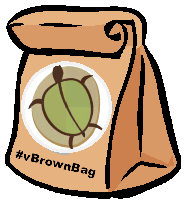 VMworld 2013 is right around the corner and the vBrownBag crew is planning for another year of Tech Talks. This year I have the privilege of participating in one them along with a couple of my fellow PernixData colleagues. Pencil these into your VMworld schedule to attend! !